Good news! DashPac no longer requires open air calibration of the exhaust AFR sensor! First unplug the diagnostic connector. 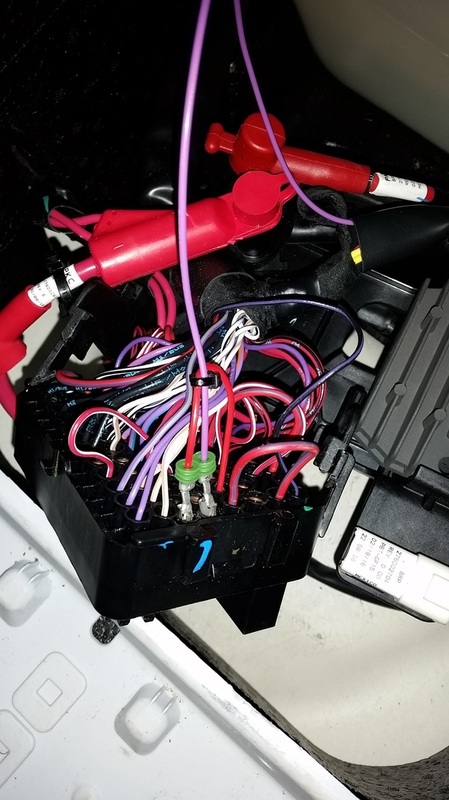 If you have 6 wires going into the connector you can skip down to the fuse installation. You already have the needed wiring, The fuse needs to be a 5 Amp fuse, One is provided. 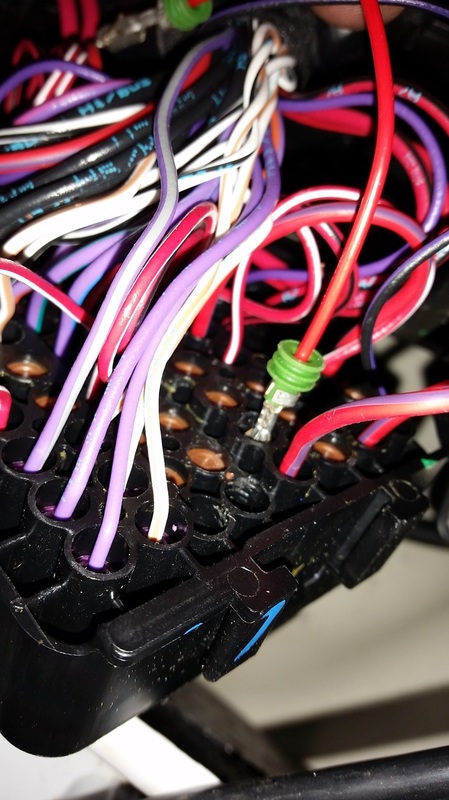 If your connector only has 5 wires you will need to follow the steps below. Remove battery cables. Black first then Red. Unhook battery hold down bracket. 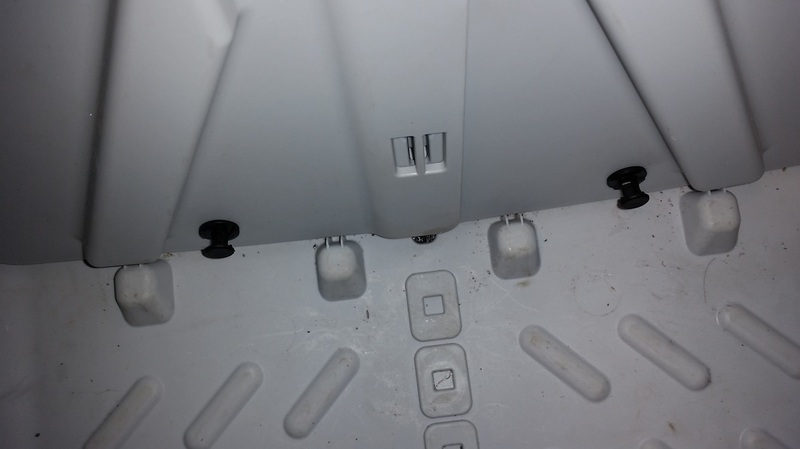 Remove (2) 13mm bolts that hold the battery holder down to the hull. Tilt the assembly forward to gain access. Carefully pull forward to get better access. Take the single pin end of the purple wire and feed it through the sheath. 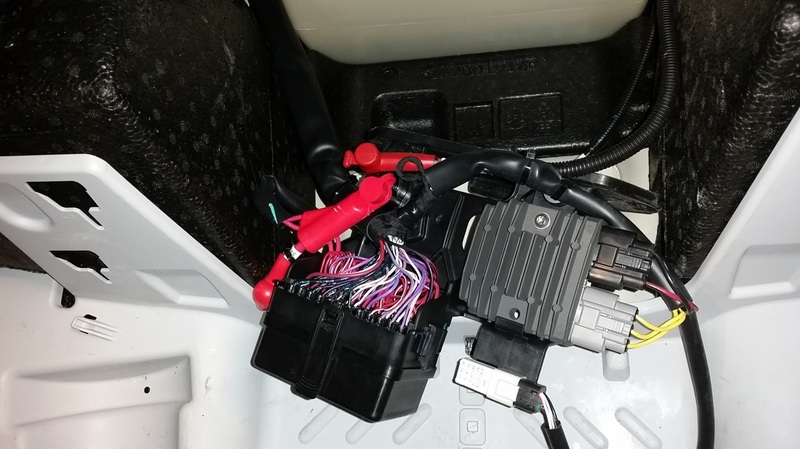 You may find it easier to cut the 2 zip ties holding the wiring to the battery tray. 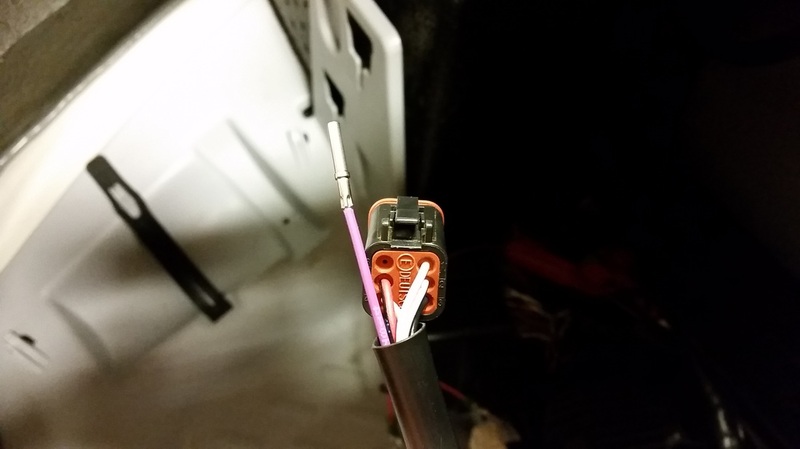 Feed the purple wire through the 2nd sheath to the diagnostic connector. 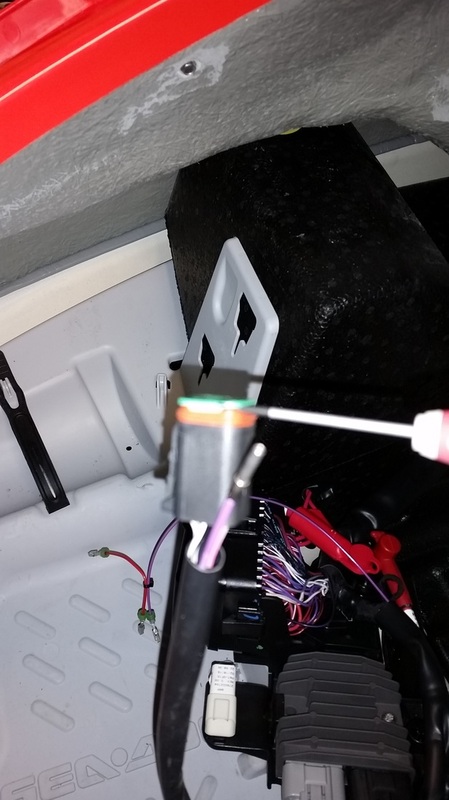 Using a small flat screw driver carefully pry the cap off of the diagnostic connector. 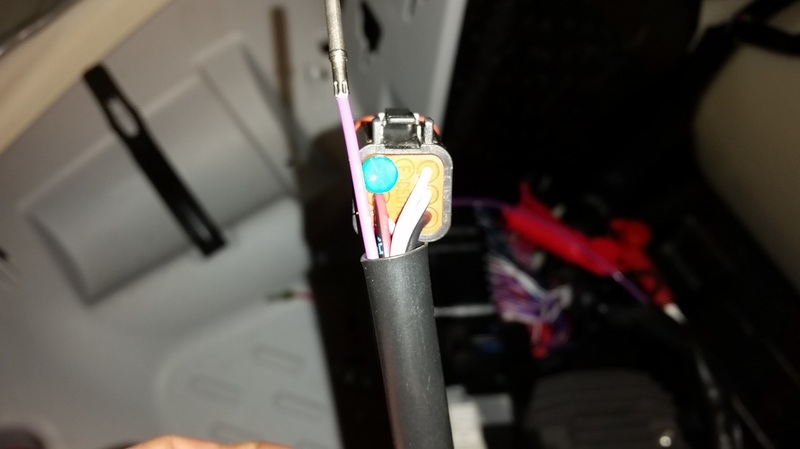 Remove the plug on the back side of the diagnostic connector. Insert the pin into the connector until it full seats and you hear a click. Pull back on the wire to make sure it locked into place. 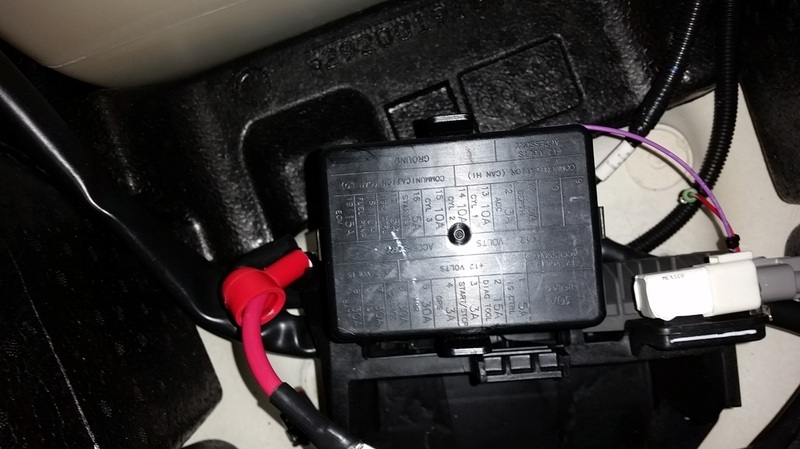 Carefully pry the tabs on the sides of the fuse box to release the fuse box from the battery holder. Pull the cover off the fuse box by using the top and bottom tabs. Carefully and evenly pull the long bus jumper out of the fuse box. The pins will bend if removed unevenly. 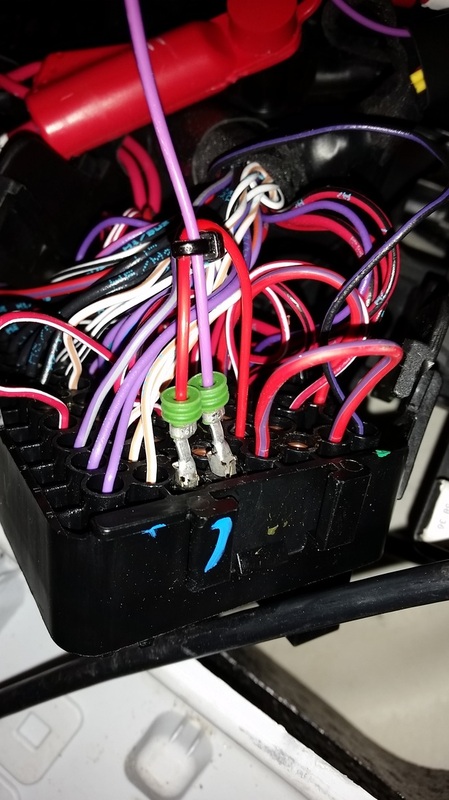 Take one of the pins on the red wire and install it in this position or any position open along the bus that you removed. It has to be on that bus to work properly. Remove the rubber plugs from the holes your going to install our wiring into. Tip; a stiff Zip tie pushed from the top down through will assist in removing the Rubber plugs that plug the bottom holes. Take the other 2 pins and install them in the positions shown. 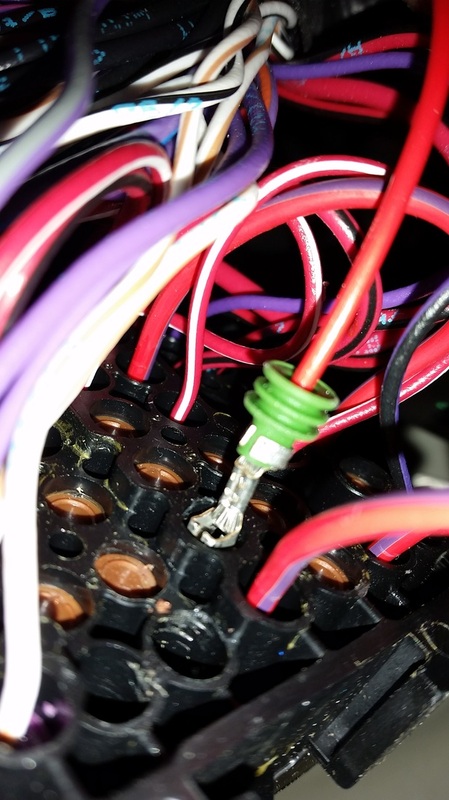 Install the 5 Amp fuse into the pins you just installed. Right side in the picture below. If you had the wiring installed already check that the fuse is a 5 Amp if its not replace it with the provided 5 Amp fuse. Now clip the fuse box back into the battery holder. Zip tie wires as needed. Reinstall the fuse box cover. 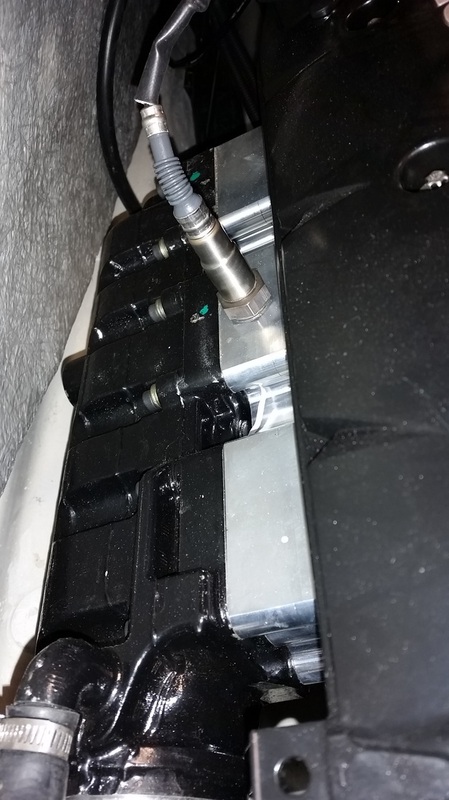 Bolt down the battery holder with the (2) 13mm bolts. Zip tie down the DashPac box. 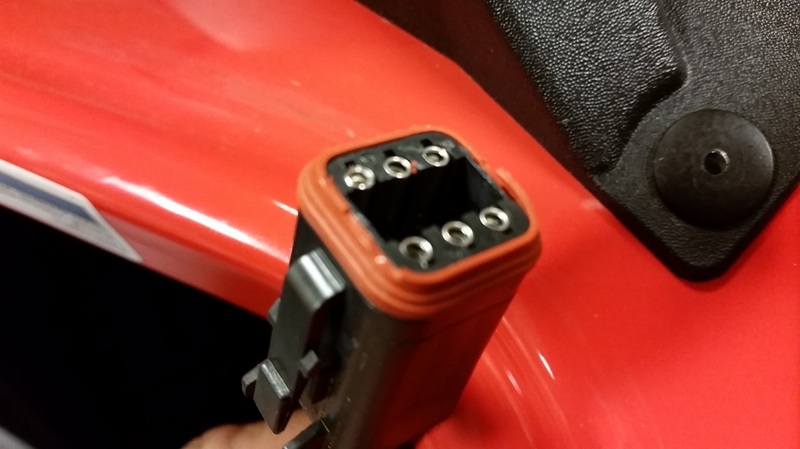 Plug one wire into the diagnostic cap, and the other into the diagnostic wire. If your installing a Scom plug the diagnostic connector into the Scom first, then plug the Scom into the DashPac. The order they are plugged in wont matter as long as the devices between the ski and DashPac have all 6 wires passing through on both ends. 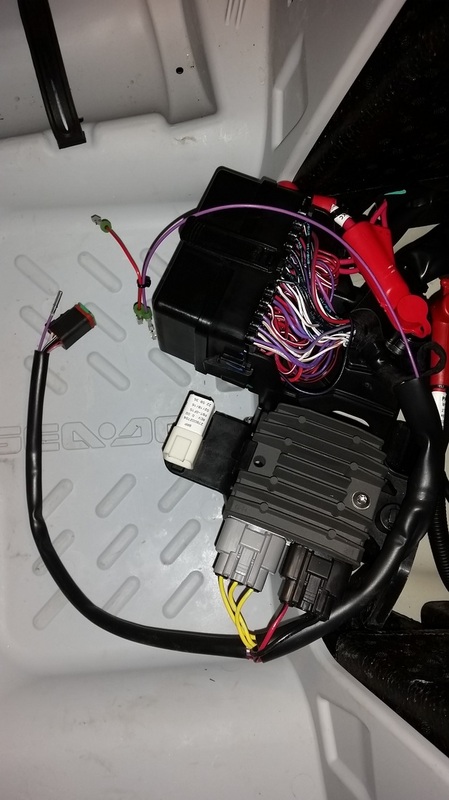 Plug in the 8 pin Lambda connectors together and feed back to the engine. Zip tie as needed. Coil any excess cable and zip tie up. Reinstall the Battery and Battery Cables in the reverse order as removal. Reinstall the battery cover doors, install both push pins, and hook the rubber strap up. 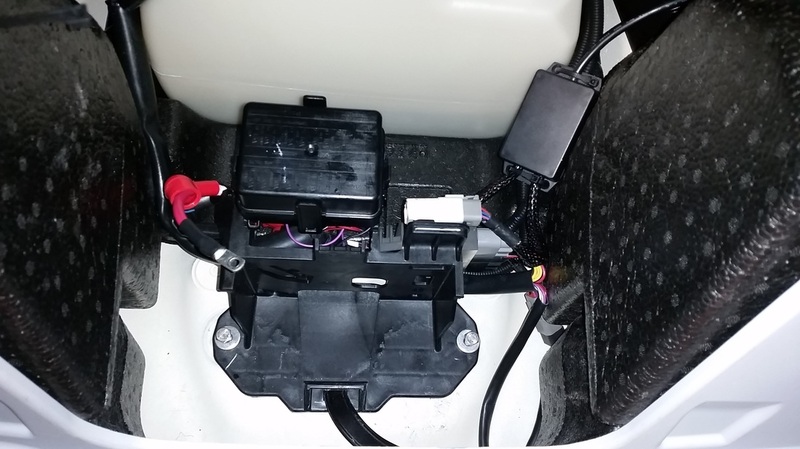 This is where you have to use your own install method for the Wideband sensor. On our DashPac Test Ski we opted for the 2" exhaust spacer. Riva also sells a drill and tap kit to install it directly into the exhaust manifold. How you install the sensor is up to the installer. We like to keep the install as neat as possible. Use up /down buttons to find display. if the display says depth push set once again. Now your in DashPac mode. Once in Depth mode push the right hand side up button to display Boost, and the down button to display AFR. Skis with Cruise Control will have to work around this a little, but our testers like this setup. THE FOLLOWING ONLY APPLIES TO THE FIRST GENERATION OF DASHPAC. 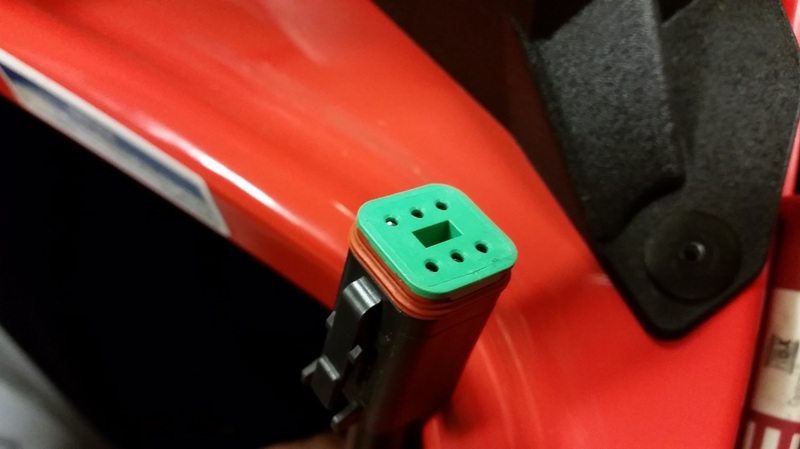 THE FIRST GENERATION HAS A 8 PIN CONNECTOR 1 FOOT FROM THE DASHPAC BLACK BOX. 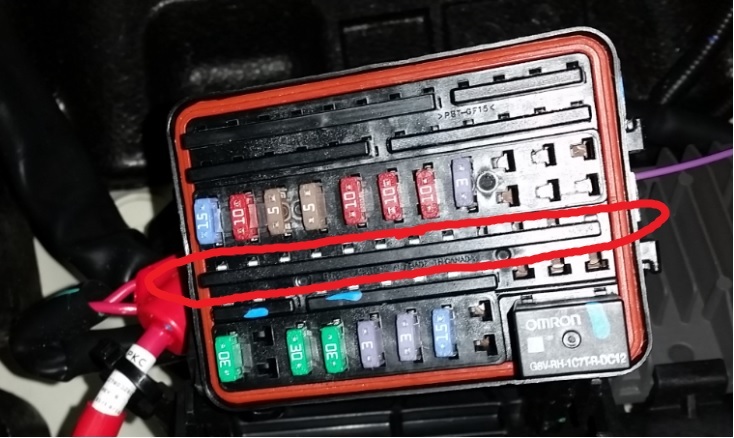 IF YOUR DASHPAC AFR SENSOR CABLE ONLY HAS 1 CONNECTOR THAT PLUGS INTO THE AFR SENSOR YOU HAVE THE NEWER GENERATION OF DASHPAC. ALSO IF YOUR DASHPAC HAS A SERIAL NUMBER ITS A NEWER GENERATION. AGAIN NEWER GENERATION DOSE NOT REQUIRES ANY CALIBRATION BY THE USER. It is also Important to understand that the controller has a calibration mode. You need to do the initial open air calibration before installing the sensor into the exhaust. AGAIN THE SENSOR CANT BE CALIBRATED IN THE EXHAUST! If you power up DashPac with no sensor hooked up it goes into Calibration Mode. At the next power up it needs the sensor in open air to calibrate the sensor. The sensor needs to be in open air for 3 minuets while powered up to calibrate the sensor. Also note that the Ski powers DashPac for up to 1-5 minutes after the ski is turned off. Unplug both sides of DashPac. power up the ski wait 2 minutes. Have the sensor in open air, plug the sensor in. or have the sensor anywhere that heat can damage anything. Power up the ski for 2 minutes. Once the sensor cools reinstall the sensor and make sure its firmly plugged in. Make sure the Sensor is Plugged in. 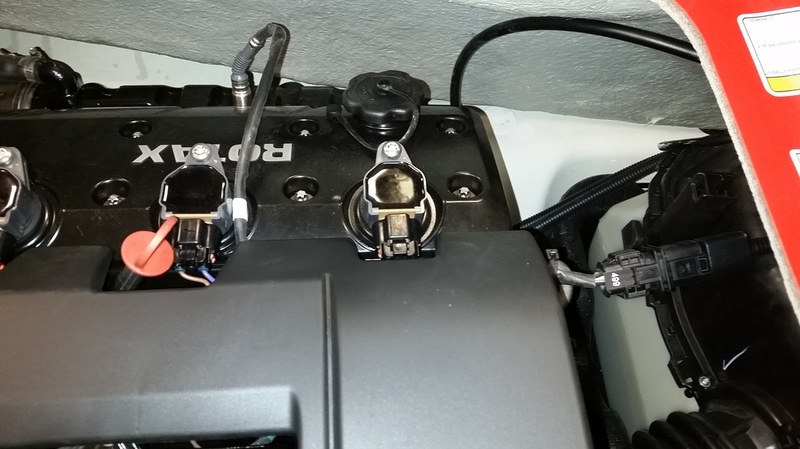 After the sensor is plugged in, plug in both DashPac connectors. If you ever unplug the sensor and DashPac is powered it will go back into Calibration Mode and you will need to follow the above procedure to re-calibrate the sensor. If you notice a incorrect AFR reading the sensor needs to be re-calibrated. If the Display reads around 14.0-15.0 and doesn't change with the engine running the o2 sensor is bad and needs to be replaced. If the display is reading slow and reacts to changing AFR slowly the sensor is going bad. Another issue we see is water on the sensor. Water will kill the AFR sensor very quickly, and can give very strange AFR readings. If you install your Sensor near a water jacketed Exhaust, Make sure the water jacket is pressure tested for leaks. AFR sensors are NOT warrantied by DashPac! Replacement Sensors can be found in our Store.